Vertical Storage Shed - Who Has The Best? A vertical storage shed can be the perfect solution if you want to store tools and equipment for your garden, and yet find that your lawn space is strictly limited. The extra height that they provide allows the owner to keep much more inside than they might have imagined, and the very best vertical storage sheds can also make an attractive addition to the garden. 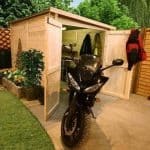 That’s why they are understandably becoming increasingly popular, and why WhatShed have created this handy guide to help you find the best vertical storage shed that can be bought online in the UK today. Just what is a vertical storage shed? 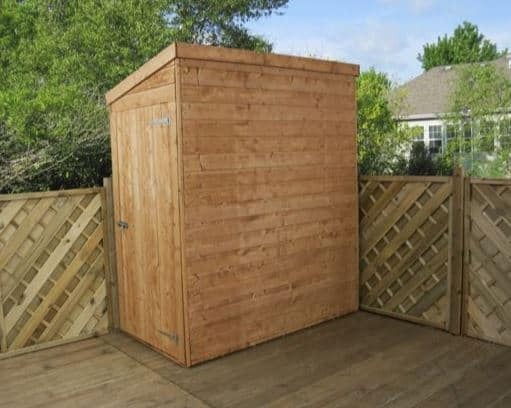 For the purposes of this league table, we have considered sheds that are noticeably tall and relatively narrow, and ones that have a height significantly greater than the width or depth, as these have excellent space saving qualities. We’ve then compared prices, and overall value for money, as well as value adding features, and aesthetic appeal. That way we were able to choose the UK’s number one vertical storage shed that can be purchased online right now, as well as nine top quality runners up. The vertical storage shed is a rather a niche garden building, and yet highly useful to those with smaller gardens. We were pleased then to find ten very different and yet high quality sheds for our league tale. It’s well done to the four foot by three foot Ultimate Shiplap shed, which lives up to its name and takes top spot thanks to a classically attractive appearance, its long warranty period and its great value for money price. Whether you want a vertical or horizontal storage shed, or a large garden workshop, WhatShed will bring you the in depth reviews that can help you find the garden building that’s perfect for you. With a base area of four foot by three foot, this vertical storage shed is one of the largest in our top ten league table. Even so, it is still compact enough to be suited to smaller gardens where space is at a premium, and the storage capacity within it is boosted the peak height of 1.77m at the top of the apex roof. At a price of well under two hundred pounds it also represents exceptional value for money, particularly as the use of shiplap cladding not only adds stability and durability, it also creates a smooth and attractive exterior. The combination of these factors is enough for this model to gain the accolade of being the best vertical storage shed available online in the UK today. The interlocking cladding and the felt covered apex roof both do a very good job at keeping rainwater out, but it’s the high quality of the timber that really impressed us. It’s made from slow grown kiln dried timber, which gives it extra strength when compared to the wood that we often see used on garden sheds. 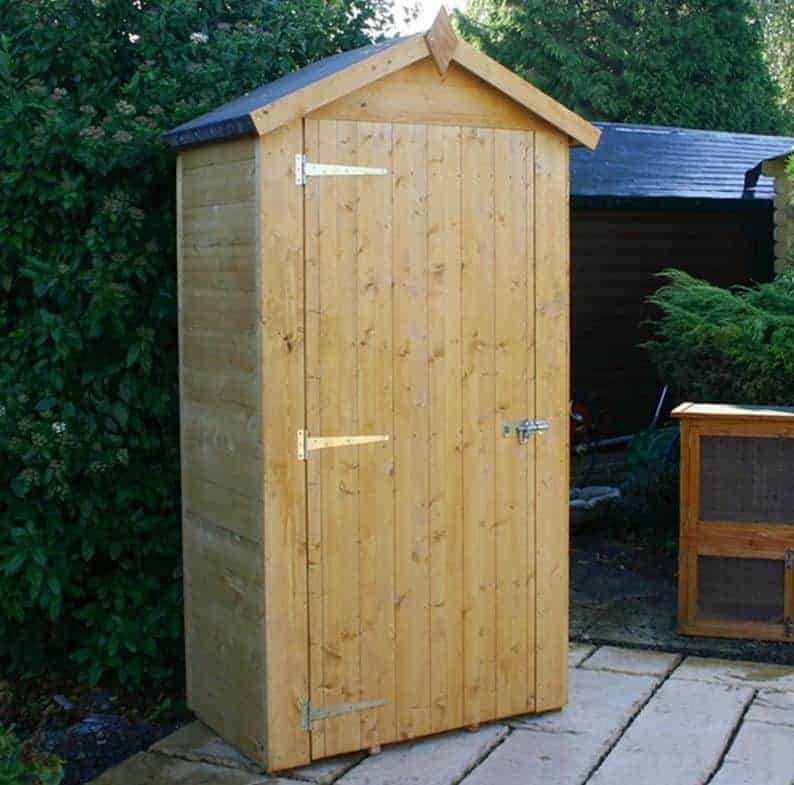 This timber has also been pressure treated to give it long lasting protection against rot, and the 15 year warranty period supplied with it is as long as we’ve seen given with any vertical storage shed we’ve reviewed. This is the very picture of a vertical storage shed, being narrow and tall, and this not only makes it a great solution for space strapped gardeners, it also makes it a very eye catching building. The base footprint is very compact, with a width of 0.93m and a depth of 0.58m, meaning that it can fit in just about any garden. The height, however, is a very generous 2.04m so there’s lots of storage space available inside. It’s ideal for taller garden items such as hoes, rakes, and strimmers, and it comes with two removable shelves, so it’s ready to use from the moment it’s assembled. We were very pleased to find that the timber used in the rain repelling tongue and groove cladding was not only FSC certified, meaning that it’s sustainably sourced and so ideal for the more environmentally conscious consumer, but has also been pressure treated. This brings with it the reassurance of a manufacturer’s 15 year warranty against wet rot, which is a mark of quality and something we always like to see provided with a wooden vertical storage shed. It adds value as well, and this combination of value, durability, and attractiveness, takes this deservedly into the runner up position in our league table. With a four foot by six foot base area, this is by far the largest vertical storage shed in our league table although it does meet our criteria by having a tall ridge height of 2.22m, which brings with it advantages and disadvantages. 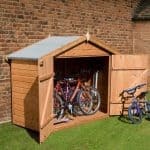 The plus side is that it provides a larger overall storage capacity, making this a good choice for those with a lot of tools and equipment to store, and even those who want a shed that they can relax and spend time inside. 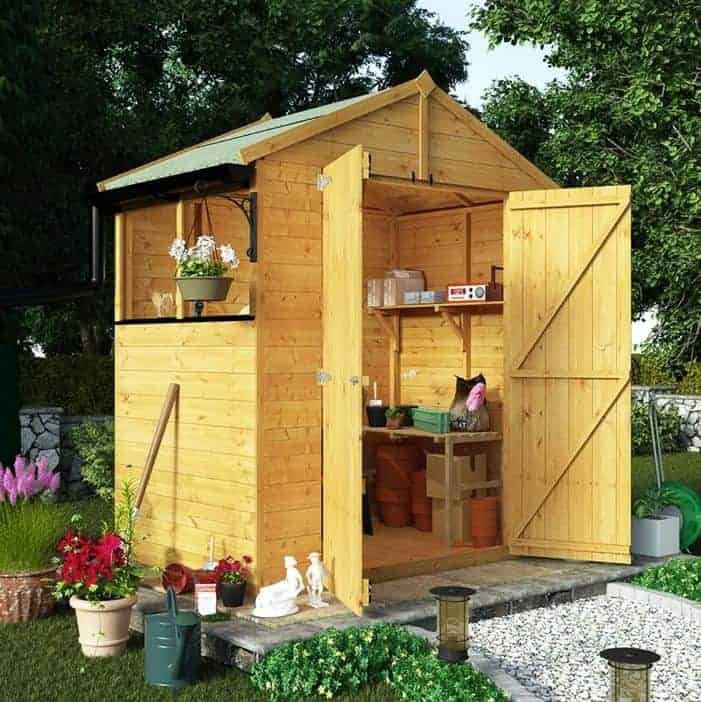 On the downside, it may be a little too large for those with very small gardens, and it’s a little more expensive than some other sheds on our list. Nevertheless, we do feel it represents very good value for money with an asking price of less than three hundred pounds, and these factors have been taken into consideration when determining its final position. One other advantage that this vertical storage shed has over all the others in this league table is that it has a window positioned on the side panel, meaning that the interior is filled with light. This makes it easier to find and retrieve items, which of course becomes more important with a slightly larger shed such as this one. We also liked the double doors at the front, so you could even use a wheelbarrow to move bulkier or heavier loads in and out of the shed. 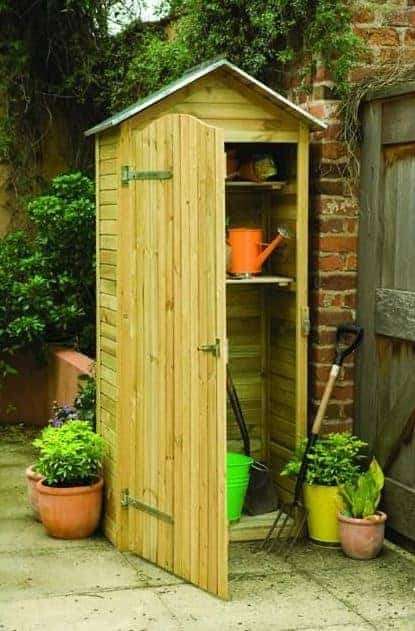 The sentry box design of this vertical storage shed is a garden classic, in our opinion. It’s small and compact on the ground, and yet it still has the good looks that can make it stand out and become a talking point in your garden. It also represents outstanding value for a shed that features high quality tongue and groove cladding for the walls, and this helps it gain a position in the top half of our WhatShed league table. The apex roof not only ensures that rainwater is instantly channeled away, which is an important factor in the fight against rot as well as helping to keep the shed’s contents dry, it gives a peak height of 2.02m. 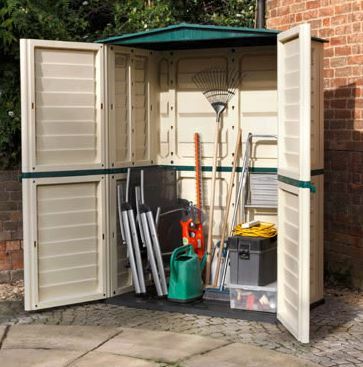 We liked this as it means that you will likely be able to comfortably stand inside the shed while storing, retrieving or organising the contents, although you may need to bend down just a little to get through the single door which has a height of 1.68m. We were also glad to see that this vertical storage shed comes with pressure treated floor joists as standard, giving it a high level of protection against the ever present threat of ground moisture. This is one of the features that allows the manufacturer to give a 10 year anti-rot warranty. 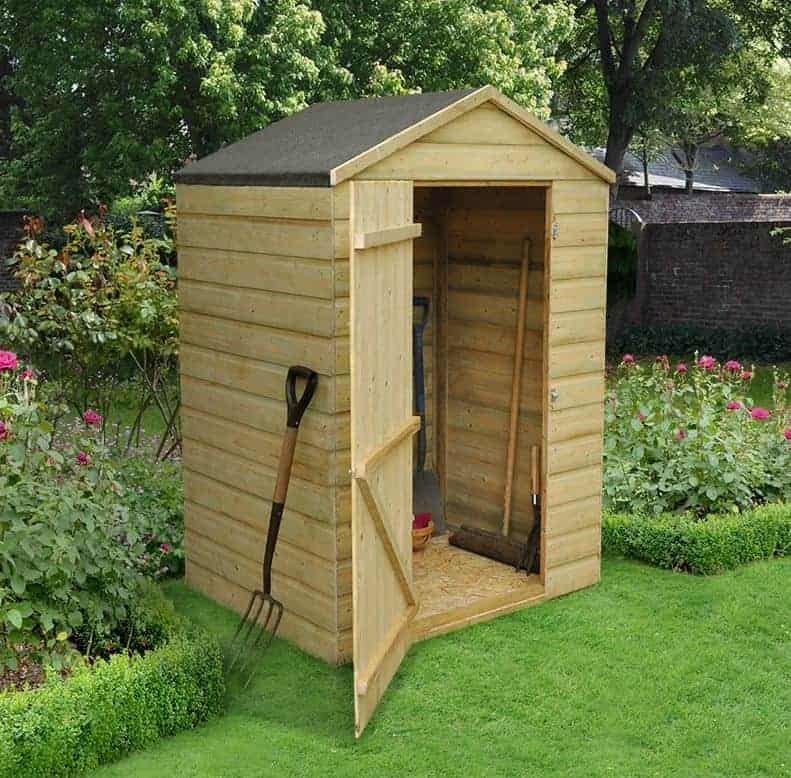 We’ve reviewed lots of Suncast sheds, and inevitably find them to be durable and good value for money, so it’s no surprise to find this vertical storage shed of theirs in the upper half of our league table. It’s the highest placed plastic shed, as well, and it achieves this distinction over its counterparts by offering even better value for money. One advantage that the plastic resin substrate used here brings is that it can’t suffer from either rot or rust, and is immune to insect and rodent attack. 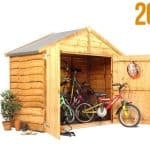 In effect it’s a no maintenance garden storage solution, making it a great choice for people who want to install their shed and then not have to do any further work on it. With a height of 1.83 there’s enough room for tall gardening items, or for many smaller items if shelving is used. We were pleased to see that the interior of this vertical storage shed contains shelf supports as well, so although the shelves themselves aren’t included it’s easy to fit them in. We were also impressed by the double walled blow moulded plastic used, giving this much greater strength and stability than you might imagine upon first seeing it. A 10 year guarantee is supplied, but we wouldn’t be surprised to see it outlast that warranty period. This is the only wooden shed in our league table not to feature an apex roof, but as it features one of the tallest pent roofs that we’ve seen it is still ideal for usage as a vertical storage shed. This also has one of the larger footprints in this top ten, with a base size of approximately six foot by three foot, although it’s lean-to style design means that it can be sited in confined spaces or even against the side of a house. The peak height achieved by the roof of 2.14m, equivalent to seven foot, means that there’s plenty of room inside for storage purposes. Many people prefer the classic look of a pent shed to the ostentatiousness of an apex shed, and we certainly found this Mercia model very pleasing on the eye. As there are no windows in this vertical storage shed it’s also a very secure garden building, as it means that passers by will be unable to see if anything valuable is being kept inside and so will be much less likely to attempt to break in. We were also pleased to see that it comes with a 10 year manufacturer’s warranty, and although this is dependent upon annual preservative treatments being applied that shouldn’t be too onerous a task on a shed of this size. 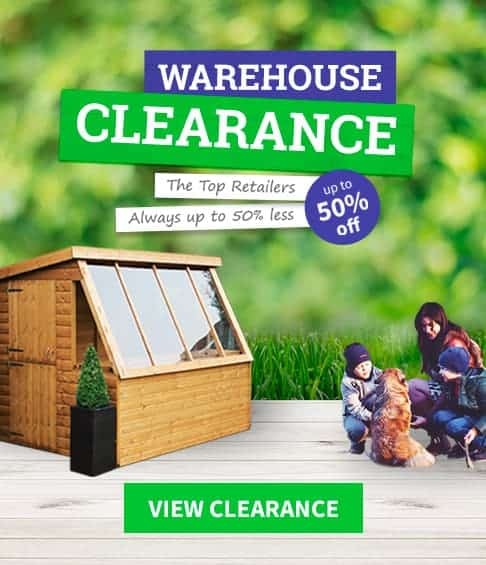 Whilst this plastic vertical storage shed from Rowlinson has a relatively wide front of 1.51m, the depth of 0.83 means that it can fit neatly into shallow gardens without taking up too much precious lawn space. The height of 1.98m, which is six and a half foot, means that there’s a large amount of storage space available, and once again we were pleased to find that the interior already had shelf supports so that shelving can be added easily. 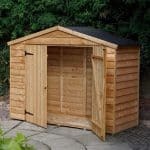 We know that many people prefer timber to plastic sheds, and this has been taken into consideration when deciding upon the position of this shed and others that have a plastic substrate. We did find it pleasing on the eye, however thanks to its cream coloured walls that contrast nicely with the green used for the apex roof and for a decorative stripe around the centre. We were also impressed by just how strong and sturdy this vertical storage shed is, making it an ideal choice for gardens that are in exposed areas or that are often exposed to strong winds. It was also good to find that this shed features an easy assembly system, meaning that the panels can be slotted and fixed into place without the need for any specialist tools. 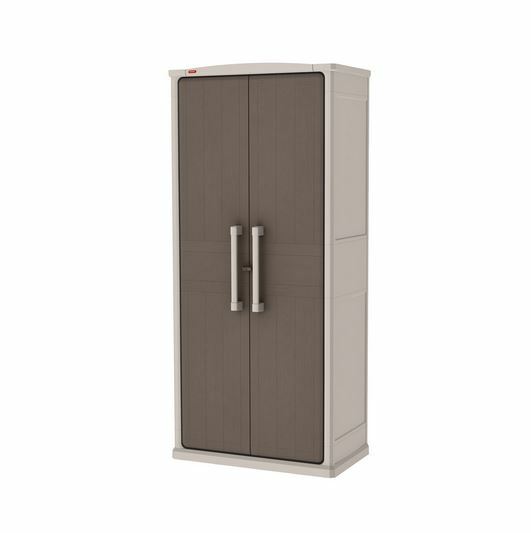 This has similarities in size and appearance to the New Mannington vertical storage shed, also from Suncast, that featured earlier in our league table. It too has a height of 1.83m, although its base area is slightly smaller, at 0.76 x 0.51m, and it’s a little more expensive two which accounts for the relative positioning of the two sheds. It also has a five year warranty, rather than the ten year period supplied with its stable mate, although with the tough and durable components used we would expect it to be much more durable than that suggests. 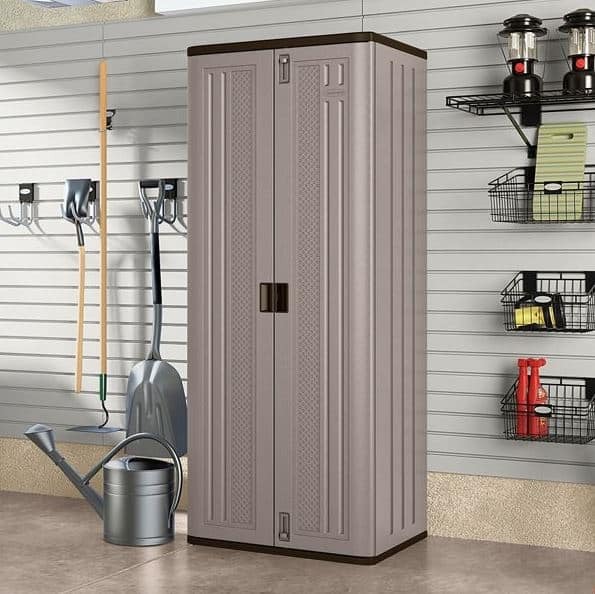 What we liked more about this vertical storage shed compared to the New Mannington is its appearance. This has been elegantly designed, with stylistic flourishes on the plastic casing that make it pleasing on the eye, and is suited to either indoor or outdoor usage. We were also impressed with the inclusion of three shelves as standard, especially as they have been reinforced with steel. This makes them very strong and reliable, and Suncast claim that each shelf can take a weight of up to 75lbs on it. 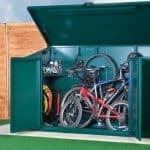 If you want to store relatively small, but heavy, items in your garden, then this could be an ideal and cost effective solution. We always like garden buildings which are versatile, which is why we like this Asgard vertical storage shed so much. 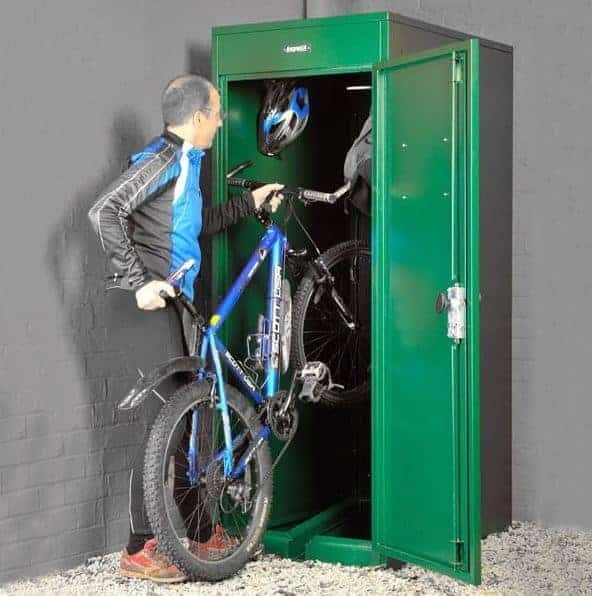 It’s been designed as a convenient bicycle locker, with a hook at the top and a channel at the bottom to position the bike’s wheels inside. We feel that it’s also ideal as a vertical storage shed for gardening tools, accessories and equipment, however, thanks to its compact footprint of 0.80 x 1.10m and a peak height of 1.99m. 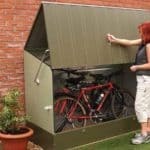 This is the only metal vertical storage shed to make it into our top ten league table, and yet you won’t have to worry about having anything too metallic looking in your garden. We were struck at first sight by just how attractive this garden building is, thanks to the dark green colour scheme which also means that it will blend in well to a garden environment. We were also impressed by just how tough and secure this shed is, thanks to the inclusion of a three point locking system which means that it can’t be drilled or picked by those looking to gain unauthorised access. With a 10 year guarantee attached to the galvanised steel cladding, this has a lot to recommend it, but it’s also substantially more expensive than any other shed on our list which accounts for its penultimate position. We move from by far the costliest vertical storage shed in our league table, to by far the cheapest. 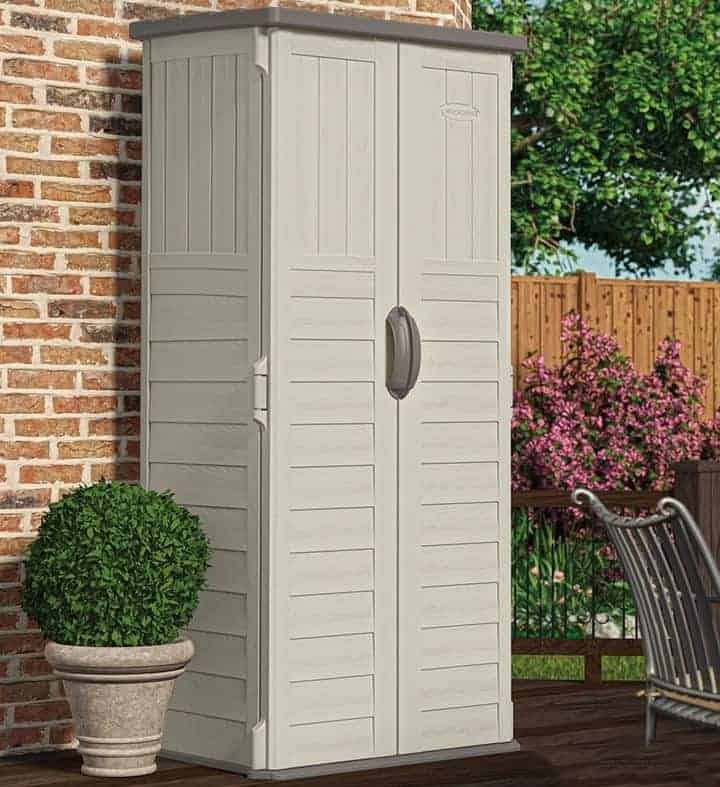 This may not be the most sophisticated or most attractive shed we’ve reviewed, but with a price of less than a hundred pounds it makes the convenience that vertical storage sheds bring available to more people than ever before, and it’s this that earns it the final place within our league table. Made of resin, which gives it excellent strength and stability for such a compact vertical storage shed, this has an undeniably plastic appearance that not everybody will appreciate. We rather liked the contrast of the dark brown double doors, with the lighter beige coloured double doors however. We also liked how the moulded resin roof had a slight bow to it, which helps to channel rainwater away rather than letting it sit on the surface. This roof has a peak height of 1.78m, and the base dimensions are 0.81 x 0.47m. This isn’t the tallest vertical storage shed here, then, but we were glad to find that it included four plastic shelves as standard. That means you can set up and use this budget priced shed very quickly. We would have liked to see an extended warranty included, but as plastic is such a tough substrate it should still provide excellent value for money.